At Central Scotland Joinery, we are committed to doing our part to help combat climate change. This includes adopting techniques and practices that conserve energy, without compromising on value, style or effectiveness. As well as installing windows and doors that make your homes more energy efficient, we also make use of a number of eco-friendly practices within our everyday business. We recycle as much waste as we possibly can. This includes taking care of your old windows and doors efficiently, making sure that valuable materials are never wasted. We are aware of how much energy it takes to create new glass, which is why we put so much effort into recycling old window panes. Furthermore all our office and personal waste, such as paper, aluminium cans and bottles, are recycled too. All of the vehicles we use to transport materials to and from your home are regularly checked and upgraded to ensure they meet our high standards of energy efficiency. We have recently invested heavily in Blue Motion technology from Volkswagen to achieve an average MPG of 70 miles! Furthemore we attempt to renew our fleet of vehicles every 3 to 5 years and invest in the latest technology to minimise our carbon footprint. We will never compromise on quality of materials, and all of our installations are built to last. Not only does this mean you will avoid waste by constantly having to upgrade your windows, it also means that you’ll benefit from materials that have also been chosen specifically for their eco-friendly formulations. For example, our timber is sourced, where possible, from well-managed local forests governed by accredited programs. Our new state of the art showroom has been designed with energy efficiency in mind. We work hard to conserve energy, helping to reduce our carbon footprint. The offices within our showroom have also been designed to minimise our carbon output. We have invested heavily in our IT infrastructure to minimise the amount of paper and energy we use. We are constantly improving our techniques and practices to ensure maximum levels of recycling and carbon reduction. 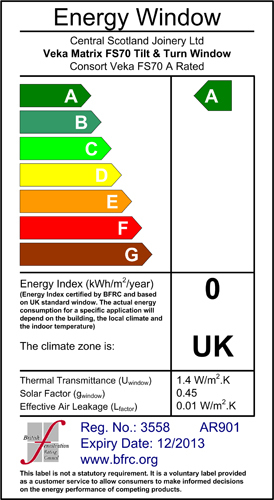 All of these measures combined mean that you can be sure you are choosing an eco friendly option when you choose Central Scotland Joinery. 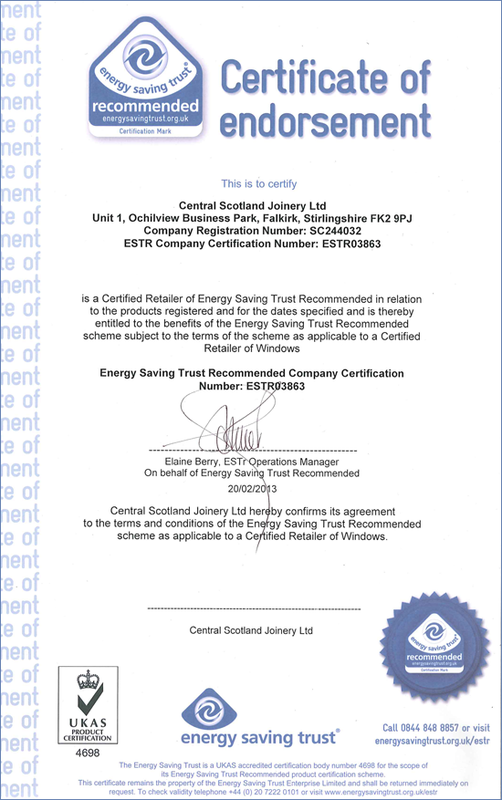 Central Scotland Joinery are proud to offer Grade A Energy Rated windows and we’ve recently been certified by the Energy Saving Trust as a retailer of recommended products (Registration ESTR03863). Our certificate can be viewed below. Central Scotland Joinery are proud to offer Grade A Energy Rated products with the Triseal Spacer bar installed. The TriSeal spacer bar is a non-conductive strip that sits between the two panes of glass in a window. Traditionally, this strip would be made from metal and would pass the cold from outside the house to inside, and vice versa. 5. Is an Award winning True Warm Technology. By offering our quality Grade A rated products we’ve been recognised by the Energy Saving Trust as a retailer of recommended products. The arrival of Super Spacer TriSeal from Edgetech I.G. has been greeted with much discussion within the world of windows. The system uses flexible foam technology and provides a long lasting energy efficient solution. In today’s world, economic and environmental concerns are paramount in most people’s minds. When it comes to construction, both household and industrial, energy efficiency is of increasing importance. Every aspect of a window can have a considerable impact on the energy efficiency of the building in which it sits, and attention needs therefore to be paid not only to the individual components within the window, but also to the overall integration of the window system as a whole. With TriSeal Super Spacer, Edgetech have attempted to address this very issue, bearing in mind an understanding of how window systems function and work within the structures of a building. The system is designed to have a long life, maintaining its insulating performance throughout, and to do this it is necessarily a durable product. An extensive programme of development and testing has naturally contributed to the production of this as the end result. A variety of warm edge spacer systems are now being used to improve energy efficiency through window construction. However, many of these systems favour stainless steel as an alternative to the traditional choice of aluminium. Where TriSeal Super Spacer offers and advantage over these, is that it is a non-metal solution. Although stainless steel systems improve energy efficiency, they will still necessarily involve some loss of heat energy due to the fact that stainless steel is metallic and is therefore a conductor. TriSeal Super Spacer eliminates this issue by using desiccated silicone foam and acrylic adhesive within a design that creates a barrier for vapour, making the system also resistant to condensation. The foam within the system makes the structure flexible and amenable to variations in temperature and pressure, as well as equipping it with the ability to withstand the weather, and to continually adapt itself to the changes in its environment and thereby last a long time. The result is a reduction in noise of up to 2 decibels and an improvement in energy efficiency of up to 15%. The vast range of benefits to using TriSeal Super Spacer include: a reduction in sealant stress, improvements in heat flow resistance, glass surface temperature, condensation and sound absorption. The TriSeal Super Spacer system has been created with a wide variety of glazing projects in mind, in terms both of varieties of building and environment, offering solutions for large and small projects in both urban and rural settings. Additionally, the system is intended to keep architects happy, since the visual impact is designed to be both visually attractive and to have as minimal as possible an impact on the sight of the window system as a whole. Edgetech have clearly invested a huge amount of development and design expertise into the creation of TriSeal Super Spacer, and the end result certainly does seem to testify to that.